OTTAWA, Dec. 7, 2017 – In our three-part series on the demise of Sears Canada, Canadian Accountant has looked at issues of management, inventory and online retail strategy, which together accounted for the retailer's filing for bankruptcy. But quality was never a problem at Sears Canada. “Sears' goods were generally perceived as being pretty good stuff, whether it was their Kenmore label, or their Craftsman label. Quality gurus like Consumer Reports generally regarded the Sears products themselves as being of pretty decent quality,” states Barry Cross, an assistant professor and distinguished faculty fellow in operations strategy with the Smith School of Business at Queen’s University in Kingston. David Soberman, Canadian national chair in strategic marketing at the Rotman School of Management at the University of Toronto, notes that Sears had always been very strong in appliances and tools. But even though their brand was good, people were still buying the same products in other places like Home Depot, Costco, Loews and Rona. When it comes to brands being developed for apparel lines, rather than a national brand, the stores that have been really successful are the ones that have developed their own private label that people like and buy, as companies like Target, with their Mossimo and Archer Farms brands, and Costco, with its Kirkland brand have done, says Soberman. “Sears didn’t invest in that, and that was something that needed to be invested in,” he adds. Soberman also notes the challenges of selling retail items like hand tools, appliances or electronics, which are periodic purchases, whereas things like clothing and food are much more regular, and draw people into the stores more frequently. When operational problems began to tip Sears Canada over to its ultimate demise, the company found itself under increasing financial pressures. For example, Cross notes, Sears had a higher percentage of full-time staff with benefits than some of their retail competitors who relied more on part-time employees with fewer benefits and lower hourly rates. “As sales started to dwindle when they started to lose market share and shoppers, they were still stuck with a higher percentage of full-time employees inside of their system,” he says. Sears, with its long history in Canada, had churned through a lot of employees who had pension benefits on the books. And when the company became a fraction of the size it had been in its glory days, it could no longer support that load, says David Zietsma, a customer experience consultant with Jackman Reinvents in Toronto, and a former vice-president of strategy at Sears from 2012 to 2014. However, Soberman notes that Canadian retailers need full-time employees, who are much more effective at dealing with customers over the long-run, to remain a viable business. “I think the people at Sears did their very best to deal with customers, and people were treated well there, which is why they were such a strong retailer for so many years. But at some point, if the actual business model isn’t right, it doesn’t matter how hard the employees work. They’re not going to be able to do anything to change the situation,” says Soberman. 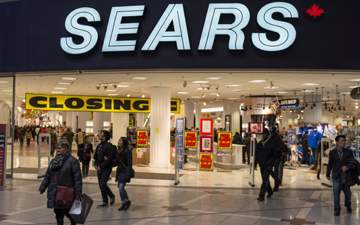 Other financial negatives began to weigh on Sears Canada. For example, Cross cites a lack of capital spending [the decline in capital expenditures was outlined earlier in this series] to develop a new strategy for its chain of stores. Zietsma says staff cuts were conducted with financial objectives in mind, not with the objective of righting the business for the path forward. He blames both management and the board. “We weren’t able to convince the board that there was something to invest in,” he says. “Without solving that problem, it led to this unstoppable path of attrition that slowly people would just wander off to other retailers, because there was no compelling reason to keep coming back to Sears,” says Zietsma.